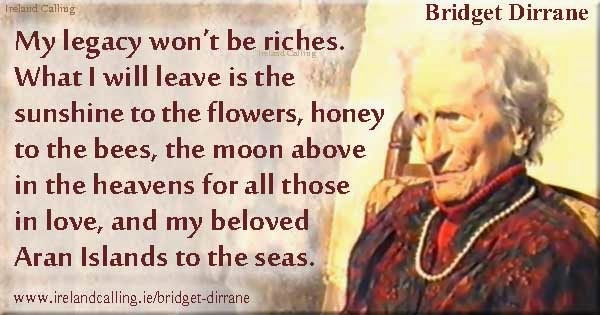 A Woman of Aran: The Life and Times of Bridget Dirrane. Blackwater Press, Dublin, 1997. This review was written in 1998. 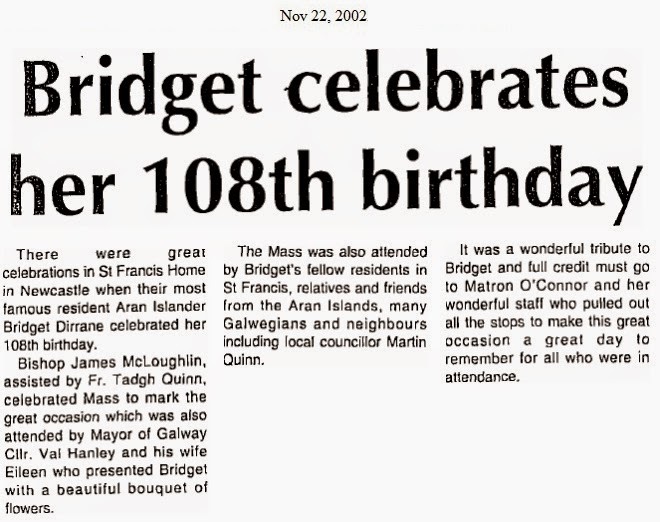 This short and delightful book celebrates the life of Bridget Dirrane who is 103 years and is still hale and hearty in the St. Francis Home in Galway. The well written and absorbing text by Rose O'Connor and Jack Mahon is derived from their conversations with Bridget. I have a special interest in her because she was a children’s nurse who looked after me and my older brother and sister when my father was Minister for Defence in the Free State government, and until he had retired as military head of the army in 1923. 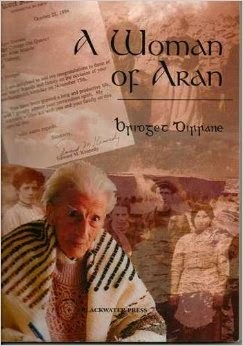 The first 28 pages deal with her family life in Aran. Her memoirs evoke a great nostalgia for the people of the West in these early years before we had become an acquisitive society and before the beauty and simplicity of our Irish language and Irish culture was tainted by foreign influences. Bridget first left Aran before she was twenty years. She had a most varied career, looking after the children of many families in Ireland and the United States until her return to her roots in Aran at the age of 72 years. Her professional life brought her into contact with many famous people, both in Ireland and among the Irish Diaspora in Boston and other parts of America. Her memories of some of these people are interesting and evocative of our recent history. 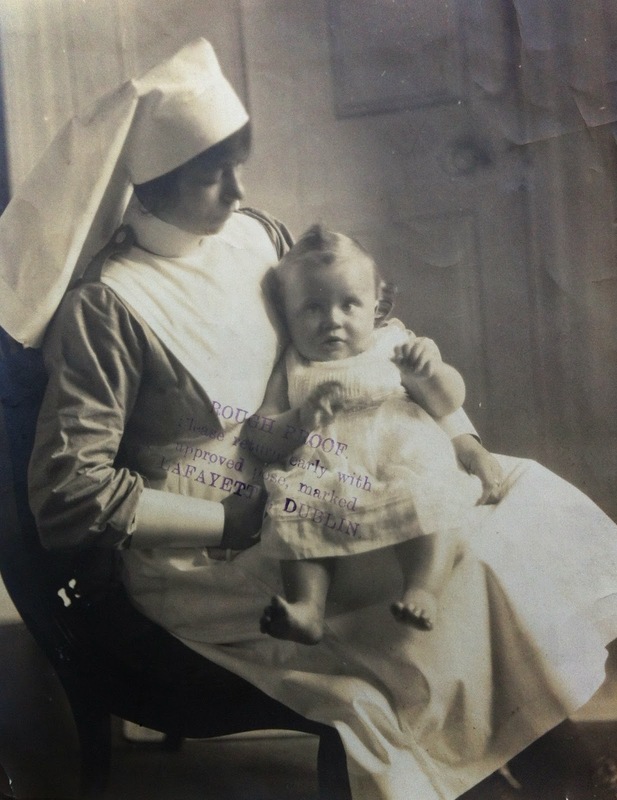 Yours truly in the arms of a Nurse Kelly, 1922 . Her story is well worth reading, even if it is only to remind us of the wonderful talents of the Irish people who emerged from the hardships and limitations of past centuries to the freedom and prosperity of modern Ireland. It is a reminder too of the great pride and satisfaction enjoyed by those in the service of the more privileged and educated families in my early days, and of how they shared the friendship and the security of the home. We had such a member on the domestic staff from 1920 to the beginning of the World War. During the 1930s my parents employed a girl after her schooling from the Gaelteacht for two or three years and then, as they reached full adulthood, they were encouraged and assisted to advance themselves by becoming nurses, teachers or following other avocations. My father’s enthusiasm for the Irish language ensured that in these later years the girls were Irish speakers from Donegal, Connemara or the Dingle Peninsula. They were appointed to maintain the Irish language as part of the household and as tutors to supervise our schooling. He loved them all because he indulged in his passion of speaking Irish from the Gaelteacht. Postscript: Myself and Louise called to see Bridget in her nursing home around the time I wrote this review. She was physically quite feeble but her mind was nimble as ever. She died on New Year's Eve 2003 aged 109. At the time she was the second oldest person in Ireland. Hmm. Not sure about the beauty of our language and culture being tainted by foreign influences. This was a recurring refrain of the Gaelic League, who banned their members from attending traditional Irish dances on the grounds that they were tainted with foreign influence. I suspect that the objection was rather to the vigorous, sweaty and decidedly sexual energy of set dancing. Indeed, the Gaelic League eventually engaged two scotsmen to invent the "traditional" Irish dances we know : the walls of Limerick and all the other inane imitations of light-opera peasant dance. The League was also shocked by the earthy vulgarity of spoken Gaelic. I am sure that you were taught in school, as was I, that there were no vulgarities in "Irish", and if you have ever spoke with native speakers you will know how far from the truth that is! The taint, I think, was a blinkered, lower-middle-class view that insisted on a bowdlerised, emasculated version of what was a real vigorous culture.